Like many things I seem to get tangled up with lately, it was one of those things that seemed like a good idea at the time. Also like many thing I seem to get tangled up with lately, it was one of those things that I ended up using every last minute of my deadline. As in, in the mailbox at 3.02pm and hoping they hadn’t emptied the mail yet. But they made it and they arrived at their destination. 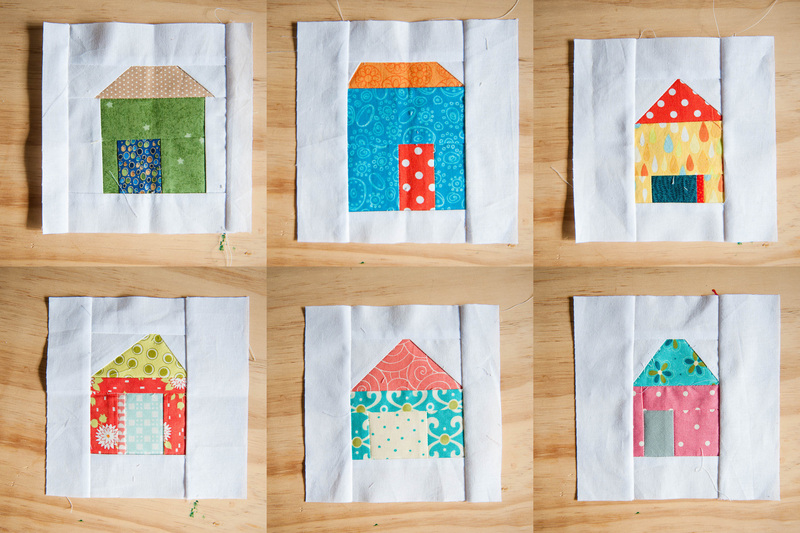 I had a blast working up these sweet little 6.5″ house blocks for the House Quilt Block Swap hosted by Gnome Angel. So cute and tiny and a great way to use up scraps. I was also lucky enough to receive six very sweet little houses in return that I will blog soon. This week sees the beginning of birthday season here in the nest. A party on Saturday to celebrate our sweet Beetle Baby’s first birthday (no, no, I’m fine, I swear. That’s not ugly crying you can hear. I just poked myself in the eye. Repeatedly) kicks off a mad 5 weeks of celebrating our little loves, with the goal of making it to mid October without wanting to throw up at the sight of cake. Crafting is very little-people-centric at the minute, and while I do have some cute stuff to show off, blogging may be a bit sporadic for the next couple of weeks. I’m aiming for at least one post a week on top of WIP Wednesday, but we’ll see how we go. Bear with me…and if I don’t return in a timely manner, come check I haven’t lapsed into a cake-overload-sugar-coma? WIP Wednesday :: party time! Like all good ideas, they are the things that get our creative juices flowing though & that can only be a good thing – time constraints aside! I LOVE LOVE LOVE your blocks! what are you doing with your finished set? I’m not sure really. I have them sitting on my desk, which we’ll pretend is more about looking for inspiration and less about needing to clean the damn studio.